← M – The Francis Marion Hotel – Charleston, SC. The Hotel Florence opened on November 1, 1881 as the hospitality showcase for visitors to George Pullman’s “perfect town” of Pullman, Illinois. The hotel was named for George’s favorite daughter, Florence. I selected this significant architectural hotel to honor all the hotels and Inns that have been renovated and given a second life. The hotel building cost $100,000 to build and interior fixtures and furnishings totaled over $30,000. The original main building contains over 23,000 square feet, with the later “Annex” addition, built in the 1910’s. The original portion of the hotel had 50 sleeping rooms, a dining room, a billiard room, barber shop, separate men’s and women’s parlors and the only bar in Pullman. The building was originally lighted with gas lights and heated with steam radiators, the steam generated by the Corliss Engine located across the street in the factory buildings. The first floor and the Pullman Suite were trimmed with cherry woodwork and accented by multicolored stained glass windows. On the second floor, the Pullman Suite was kept for George Pullman when he visited the factory and town, as the Pullman family lived in the fashionable Prairie Avenue District, just south of downtown. The second through fourth floors housed the hotel rooms and suites. Each floor, similar to train cars, provided a different “class” of service. The more elegant and expensive rooms were located on the second floor, where they were closer to the lobby. These rooms were outfitted with Eastlake furniture and sometimes included larger suite layouts. The rooms on the third and fourth floors were smaller and furnished in different styles on each floor. The Historic Pullman Foundation bought the Hotel Florence in 1975 to save the aging building from demolition and to renovate it. 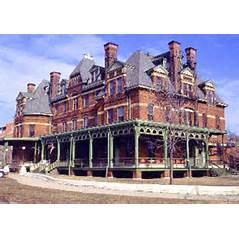 In 1991, it was sold to the Illinois Historic Preservation Agency as an integral part of the Pullman State Historic Site. Today, the Hotel is undergoing a major capital improvement program by the state to restore the Hotel for future use with the State Historic Site. 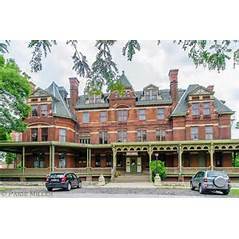 This entry was posted in A to Z Blog Challenge April 2016 and tagged Illinois Historic Preservation Agency, The Historic Pullman Foundation, The Hotel Florence-Pullman IL.. Bookmark the permalink. It looks familiar. But it can’t be as I’ve never been there. It’s a beautiful building! Thanks for showing. I have never been to see it up close and personal…but one can imagine this amazing structure filled with life and light, people coming and going. I’m grateful they had the foresight to save the hotel. The names of old hotels and inns can often give a tantalising glimpse into the history of their location. Names like “Railway Hotel” and “Station Hotel” abound in towns that haven’t seen a traion in many decades, while “Fox and Hounds”, “Hunstman’s Inn”, “Traveller’s Rest” all speak to bygone usages and practices. It’s a fascinating topic. Wish you would consider doing five day blog tours like I have written with photo support. One on Charleston, SC, Chicago, Burford in the Cotswolds where my first novel is set. Would love to read about the English places you have named. The research is fun and you would do a great job. A little more complicated, Stpheny, as I haven’t lived in UK for ten years. However, there are hotels in the area where I live, which could merit some research. I would SOOOOO love to visit here! If not here, it may cause you to think of the hotels or inns in your area that you have not paid attention to, but have a good story. Is there a hotel in your community that you have taken for granted, but needs a visit? Let me know if you find a place that is possible to visit. Great choice of a hotel for the topic of naming. Makes me wonder how his other children felt about not being named. So glad this historic hotel was saved from demolition! I thought about that too. In my imagination I thought of an entire novel based on the naming, the family dynamics. I may have to play around with this and write a few scenes to see some potential. Hope there is a hotel or inn close to you that needs community appreciate and revitalization. Let me know if you think of one you can go and visit. Oh my gosh, it is beautiful! Isn’t it something. In my research, I was amazed that buildings like this were built in a short time, six month, less than a year. Tells you something about the work ethic of the companies that built hotels in those days. I’m glad you enjoyed my response to the letter N-naming a hotel. Thanks for your visit and comments. You have found some beautiful places to write about. I’d love to be able to stay in some of them. Hope you will think about a hotel or inn near you that you might have over-looked that has a great story to experience. Let me know if that happens. A beautiful building, Stepheny. Thanks for the history lesson 🙂 Thinking of maybe visiting Myrtle Beach for the first time later this year. Will you consider doing something on a Myrtle Beach hotel or inn? Congrats also on being ahead of the game with the A-Z challenge. I did that last year and it was a huge advantage! Living in North Carolina, I will ask friends who know Myrtle Beach well where they would recommend while staying there. Hold the thought.